Neuro-Zyme Enzyme Enhancing Capsules help bring neuropathy relief by breaking down toxins in the body. 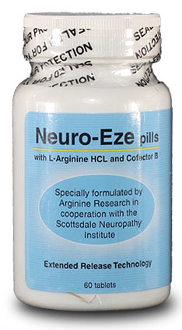 Neuro-eze Capsules were specially formulated by Arginine Research in cooperation with the Scottsdale Neuropathy Institute. Each neuro-eze product contains L-Arginine HCL.